Trinamool Congress chief Mamata Banerjee has accused the BJP of masterminding the whole thing. Kolkata: A dozen top Trinamool Congress leaders will be watching the Supreme Court at 2 pm today when it will decide if the CBI should probe the Narada sting or not. A news website, Narada News, had alleged a huge corruption scandal last year when it reported that Trinamool leaders - most of them elected lawmakers - were seen in hidden camera footage taking wads of cash from a man posing as the owner of a company, apparently seeking favours from the Mamata Banerjee government. On Friday, Calcutta High Court told CBI to hold a preliminary probe within 72 hours and file an FIR. Sources say the preliminary report includes the names of all Trinamool leaders seen on the sting operation footage. Yesterday, Trinamool leaders Saugata Roy and others moved the Supreme Court to stop the CBI probe. The Calcutta High Court's 72 hours ends today. A CBI team, which has been going through hours of tape and reams of documents, is expected to submit its report to the High Court today - perhaps at the same time as the Supreme Court hearing. When the CBI will file the FIR is not clear. When and if it does, all the Trinamool leaders under the lens are likely to be called for question and could even be arrested. Trinamool chief Mamata Banerjee has accused the BJP of masterminding the whole thing. "One lakh, two lakh at election time is not a factor. No one asked for money, it was a donation," said Mamata Banerjee on Friday, stressing that that was not illegal. "But the sting was published by BJP first. And how did a BJP leader announce last month that, after UP election, the CBI will probe Narada case?" she asked, adding, "And how much money has been spent in the UP elections? We should know." But opposition Left and Congress have claimed "match-fixing" between the two political sides, citing the Monday's trust vote in Manipur where the lone Trinamool legislator has supported the BJP government helping it form government despite winning fewer seats than the Congress. "I supported the BJP government with the full support of the party," the MLA T Rabindra Singh has said. Trinamool MP Mukul Roy reportedly countered the claim saying, "We can take disciplinary action against him at any time. But we have not done so fearing a threat to his life." Bengal Congress chief Adhir Ranjan Chowdhury said, "TMC and BJP have a friendly tie. On the outside, it looks like they are fighting, but on the inside they are friends." The CPM, which held day-long protests outside the CBI office in Kolkata on Monday, repeated the charge. "Modi bhai, Didi bhai to serve mutual purpose," said CPM MLA Sujan Chakraborty, taking a dig at Ms Banerjee, who is popularly known as Didi in West Bengal, and Prime Minister Narendra Modi. 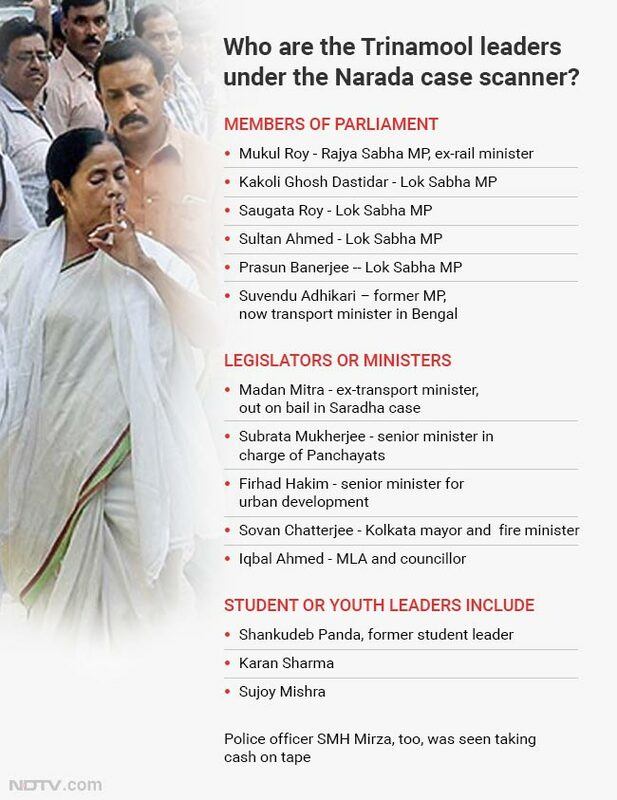 A Trinamool leader, who did not wish to be named, told NDTV: "I don't care about the politics. But the sting and the CBI probe have hurt our image among ordinary people."